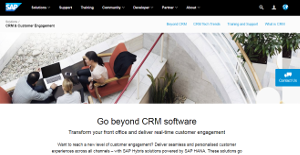 SAP CRM is a customer relationship and engagement platform built to greatly enhance your engagement capabilities and enable you to provide smooth and personalized customer experiences at every opportunity and across multiple channels. The software improves your sales and marketing as you discover new insights that are covered deep under tons of customer and social information. You are able to boost customer engagement, drive sales, and streamline order-to-cash processes among others. SAP CRM brings to the table a set of advanced capabilities on top of core sales force automation that offer far beyond what traditional CRM features can provide. With SAP CRM, you are able to uncover insights that will give your sales teams the edge they need to sell smarter and improve their performance. SAP CRM makes it easy for businesses to simplify their sales processes with better customer engagement, accurate forecasting, and real-time pipeline management. For your business to grow, you need to market your products and services. SAP CRM helps you target the right people based on their needs and wants. The good news is that you get all your data in real time, giving you everything you need to provide your customers and potential clients with contextual, personalized and relevant omni-channel experiences. Whenever your customers come to shop at your digital stores, SAP CRM gives you the ability to supply them with a unique digital shopping experience through the channels they prefer – mobile, social, and e-commerce. Armed with high value and very actionable insights, you are able to customize their experiences based on actual data. SAP CRM also helps you manage your whole inventory in real time while still keeping costs on other areas of your operations minimal. There are well-liked and widely used systems in each software group. But are they necessarily the best fit for your company’s special requirements? A popular software application may have thousands of users, but does it offer what you need? For this reason, do not blindly invest in popular systems. Read at least a few SAP CRM reviews and mull over the elements that you wish to have in the software such as the fees, main features, available integrations etc. Then, choose a few systems that fit your requirements. Check out the free trials of these apps, read online reviews, get information from the vendor, and do your investigation thoroughly. This profound groundwork is sure to aid you find the finest software solution for your firm’s unique needs. How Much Does SAP CRM Cost? Contact SAP CRM for enterprise pricing information and other product details. You can also submit a request for a free trial to see if the software is a perfect fit for your business. We realize that when you make a decision to buy CRM Software it’s important not only to see how experts evaluate it in their reviews, but also to find out if the real people and companies that buy it are actually satisfied with the product. That’s why we’ve created our behavior-based Customer Satisfaction Algorithm™ that gathers customer reviews, comments and SAP CRM reviews across a wide range of social media sites. The data is then presented in an easy to digest form showing how many people had positive and negative experience with SAP CRM. With that information at hand you should be equipped to make an informed buying decision that you won’t regret. What are SAP CRM pricing details? What integrations are available for SAP CRM? Pros: It makes everything look simple when you are using this CRM software. Since we use the business warehouse and ERP systems, we can easily integrate them with this tool for efficiency. It presents an attractive atmosphere on which you can do business with ease. We have stations in different locations and countries which makes our set up complex. Luckily, with the help of this product, we can manage data with the utmost efficiency in those remote locations which is a plus on our part. In short, the SAP CRM tool has made our work easier in terms of managing data among other functionalities it brings with it. Cons: It has everything we need to manage the sales data in our system. However, it can prove to be a difficult product especially for new users. It has a learning curve which brings the need to train new staff members if you want them to use it. With me, I did not experience this problem but with most of our sales team, this was a tough mountain to climb. The bigger problem was with when you wanted to make changes into the system. Its complex functionalities were difficult to master within a short period and thus new users took a lot of time to learn and navigate around the tool. Pros: It is the utmost solution when you want to manage multiple units in your business or company. This is due to the fact that it allows for multiple add-ins and thus you can install them into your system depending on your business needs. It is highly customizable when you want to create tailored reports. Since I am in the finance industry, I can utilize this tool when coming up with such reports. The sub ledger capture feature is ideal when I want to track revenue and expenses for my business. In short, it makes my work easier and less time consuming. Cons: The whole process of finding your way around the tool can be an outdated one and the experience is not user friendly. The appearance of the user interface is not what you would expect for a modern tool such as the SAP CRM. Despite it being exceptionally great in terms of managing data and analysis, there are few obstacles you have to deal with before you get to the good stuff. To understand how each feature works or how to use it, you will need guidance every step of the way or else you will get lost on the way.